Gascogne — French premium Tier VIII battleship. A battleship design developed on the basis of the very successful Richelieu class, which received improved AA capabilities and had the main turrets placed in the ship's aft and forward ends. Like her prototype, the ship boasted a high speed and very good torpedo protection. 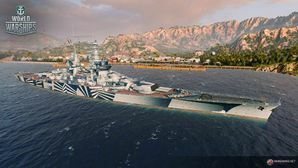 Tier VIII French premium battleship Gascogne has the same two quad-barreled turrets found on her tech tree counterpart Richelieu, but in a more conventional layout where one turret is forward of the superstructure and one behind. The two ships share many similarities aside from the gun placement: they have identical handling, speed, and concealment, while their guns, secondaries, and health are near identical. As a result, playing them similarly will net fairly good results, though Gascogne has her own quirks. To address the elephant in the room, Gascogne does not have particularly good guns. They suffer from comparatively poor dispersion and sigma, meaning it can be an exercise in frustration trying to land shells on target. Richelieu has the same issue, and the solution towards mitigating the floundering accuracy of their main batteries is similar as well: use Gascogne and Richelieu’s superior speed and handling to flank enemy positions, getting those juicy broadside shots on them. They are tied for fastest battleship of Tier VIII, with a respective top speed of 32 knots. This can be further boosted using the Sierra Mike ( ) signal, plus the Engine Boost ( ) consumable found on all French battleships at Tier VIII and up. Combined, all these factors create a battleship capable of hitting ludicrous speeds (compared to other battleships). Gascogne, on top of being agile, has fairly good armor. While she does not have Bismarck’s level of protection, it is not bad at all. Her citadel is well protected against shells and bombs alike, and sits just at the waterline. She won't be taking massive, un-healable hits very often; though some care should still be taken in close quarters, since it becomes much easier to send shells into Gascogne’s citadel. However, there is a massive drawback to Gascogne’s armor scheme, as she has 32mm of plate almost everywhere. This makes it exceptionally easy for HE shells to do significant damage to her when given the opportunity, and normal AP penetrations will quickly gouge away her health. While her citadel is indeed well-protected, that simply is not the case for the rest of the ship. Thankfully, Gascogne’s survivability issues are mitigated somewhat by her unique Repair Party ( ) consumable, which has a faster cooldown than usual at 60 and 40 seconds for normal and premium versions, respectively. This works well in conjunction with her armor, since most the damage Gascogne takes will likely be of the repairable variety. Higher reload speed of 28 seconds helps offset the different gun layout from Richelieu. Better sigma (shell distribution inside her dispersion circle) than Richelieu (1.9 vs. 1.8). High top speed of 32 knots, able to be increased even further with the Engine Boost ( ) consumable. Good shell velocity helps with long range gunnery. Impressive secondary battery with a great 7.0 kilometer base range. Quadruple-barreled turrets means she always has four guns on target at any given time. Quick cooldown on Repair Party ( ) consumable. Turret arrangement makes it tricky to use all eight guns at once. Relatively weak broadside for a Tier VIII at only eight (8) 380mm guns. Takes large amounts of damage from battleship AP when caught broadside. Reload speed is still worse than the other Tier VIII battleships armed with 15-inch guns like Bismarck and Monarch. Health pool is on the low side for a Tier VIII battleship. Like all French battleships, she is coated primarily in 32mm plating all across the entire ship, making her highly vulnerable to HE shells from enemy heavy cruisers and battleships. As a premium ship, Gascogne doesn't have any upgrades to research. Slot 1 provides two viable options. Generally, Main Armaments Modification 1 is recommended because it increases the survivability of the main battery guns. With only two turrets, the loss of one decreases the ship's primary firepower by 50%. Players wishing to specialize in the secondary armament or in AA duties should mount Auxiliary Armaments Modification 1 ( ) to increase the survivability of those armaments. Slot 3 allows for the specialization in different roles. To reduce the dispersion of the main battery, players should mount Aiming Systems Modification 1. Alternatively, Secondary Battery Modification 2 ( ) will increase the firing range and reduce the dispersion of the secondary armament. To increase the range of the AA armament, mount AA Guns Modification 1 ( ). Slot 4 provides players a choice between survivability and maneuverability. To reduce the rudder shift time, players should mount Steering Gears Modification 2. Players wishing to reduce the amount of time that fires and flooding inflict damage to the ship should mount Damage Control System Modification 2 ( ). Key skills for Gascogne commanders include Expert Marksman at Level 2, Superintendent at Level 3, and Fire Prevention at Level 4. Basic Firing Training, Advanced Firing Training, and Manual Fire Control for Secondary Armament are recommended for players looking to specialize in the ship’s secondary armament. Basics of Survivability is recommended to reduce repair time. Concealment Expert is also recommended to reduce the ship's detection range, allowing her to close in further while remaining undetected. Because Gascogne is a high-tier premium ship, it is recommended that Captains use the premium versions of the consumables, especially Damage Control Party and Repair Party, to improve her performance in battle. Her repair party is of special note, since both the normal and premium versions have a faster than normal cooldown of 60 and 40 seconds, respectively. As a premium ship, Gascogne comes included with Type 10 camouflage that lowers her detection radius, reduces the accuracy of incoming shells, reduces her repair costs, and increases the amount of experience she earns. As a battleship, the Gascogne has 8 slots for signal flags. Standard flags to take as a battleship are India Delta ( ), November Foxtrot ( ), and India Yankee ( ). These flags help increase the survivability of the Gascogne. In addition, Sierra Mike ( ) will help the Gascogne go slightly faster and Mike Yankee Soxisix ( ) will boost the power of the already strong secondaries. A catapult fighter from Gascogne surveys the damage. Line drawing of "Battleship B3 ter", the plans for what would have been Gascogne. The most conspicuous change with Gascogne would have been the return to a main artillery arrangement with a quadruple 380 mm (15 in) gun turret aft. This rearrangement also would shift superstructures forward so that these were now mounted almost exactly midships and no longer at a considerable distance aft of the midship position. Gascogne's secondary artillery would have been three triple turrets of 152 mm (6.0 in) caliber, all on one axial line, two in a superfiring position forward and one between the funnel and the aft 380 mm (15 in) turret, which freed up the sides of the ship for eight anti-aircraft dual mountings of 100 mm (3.9 in) caliber. As the 152 mm (6.0 in) guns' magazines would have been near the main artillery turrets' magazines, which would increase risks, the 152 mm (6.0 in) turrets' armor had to be improved. In July 1938 it was proposed to increase the turret armor thickness to 190 mm (7.5 in) on the faces (instead of 130 mm (5.1 in)), 120 mm (4.7 in) on the roofs and 100 mm (3.9 in) on the sides (instead of 70 mm (2.8 in)); the barbettes would have remained at 100 mm (3.9 in). In February 1939, a rebalancing was proposed with a thickness of 150 mm (5.9 in) for the barbette, 155 mm (6.1 in) for the turret faces, and from 135 mm (5.3 in) to 85 mm (3.3 in) for the turret sides. A thinner upper armored deck had been considered, reducing its thickness to around 145 mm (5.7 in), instead of around 160 mm (6.3 in), but there is no proof that such a decision was actually taken, beyond a Service Technique des Constructions Navales (STCN) recommendation dated 5 March 1938. In the December 1938 designs, aircraft installations were intended to be fitted at the ship's center, with trainable catapults between the fore tower and the funnel, with a hangar at the aft tower's base. Problems with positioning the 100 mm (3.9 in) AA battery too near the main and secondary batteries resulted, in February 1939, in re-positioning the aircraft installations at the ship's stern. A single axial catapult would have had its pedestal countersunk in the quarterdeck, with an internal hangar in a recess under the first deck and a lift to hoist the seaplanes to the first deck level to avoid the blast effects of the rear 380 mm (15 in) turret firing, which also would have required raising the aft 381 mm (15.0 in) turret up one deck, on the Vittorio Veneto-class battleships. The hull seaplanes would have been of a new twin-motored type, the Farman/NCAC NC 420, with an increased endurance (1,350 km at 240 km/h, versus 1,125 km at 150 km/h for the Loire 130). Its prototype was almost complete in June 1940 but never flew. Two seaplanes would have been stowed in the hangar in line, and a third one would have been parked on rails on the quarterdeck, to the aviation hangar's starboard. Thus, the eight 100 mm (3.9 in) CAD Model 1937 turrets would have been positioned in four groups of two, amidships, in the four corners of the superstructure. Each group of two turrets would have had a fire control system, with a 5-meter (16 ft) OR; for the forward groups this would be on each side of the fore tower, and for the aft turret groups it would be atop the aft tower. Thus, the backup system for the 152 mm (6.0 in) battery would have been eliminated, and the secondary battery's fire control direction insured by the upper system in the fore tower for anti-ship gunnery and by the 100 mm (3.9 in) battery's systems for anti-aircraft gunnery. The six 37 mm (1.5 in) AA Model 1935 guns would have been installed with four mountings abeam the forward turret (two on the forecastle and two a little abaft, one deck higher), with their fire control systems amidships between the fore and the aft tower, and the two would have been positioned abeam the aft superstructure with their fire control systems a little forward and one deck higher. The 37 mm (1.5 in) zénithaux quadruple mountings were repositioned amidships between the fore and aft towers, because on the quarterdeck – as on Clemenceau – they would have been excessively exposed to the blast from the aft main turret. Original plans called for Gascogne to be laid down in August 1939. Material shortages postponed her scheduled start-of-construction until May 1940. The German invasion of France on 10 May 1940 halted all plans and progress on her construction; she was never completed. Gascogne is depicted in a hypothetical 1941 configuration. However, the Navy Blue disruptive camouflage suggests that Gascogne is in 1943 condition. She should be fitted with quad 40 mm Bofors guns and 20 mm Oerlikon cannons, which became standard on French ships that were refitted in the United States after they sided with the Allies. Gascogne's sister ship Richelieu was not painted in disruptive camouflage until 1943 when she was refitted in New York. Actual light AA battery consisted of six 37 mm/50 1933 guns and five quadruple 13.2 mm Hotchkiss machine guns. The 37 mm/70 ACAD Mle 1936 gun was not provided in time for the Richelieu-class battleships. As such it is unlikely it would have been completed in time for Gascogne either had she been built. Furthermore, the weapon had numerous development problems, resulting in delays which led to its cancellation in 1940. Only one prototype existed. Few, if any of the 25 mm Hotchkiss guns entered service with the French Navy before the 1940 armistice. A cross-sectional drawing of a quadruple 380mm turret, such as those found on Richelieu and Gascogne. Details of Gascogne’s aviation arrangements. A detailed look at Gascogne’s intended armor scheme. This page was last modified on 19 February 2019, at 10:20. This page has been accessed 65,045 times.